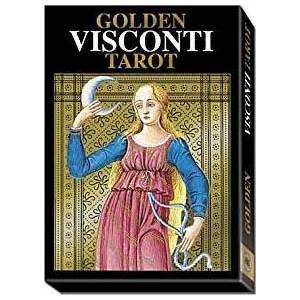 A new edition of one of the world's first tarot decks and a jewel of the Italian Renaissance, the Golden Visconti Grand Trumps deck features brilliant gold foil impressions that make every reading a rich and rewarding visual experience. Use these cards to uncover the hidden aspects of important events and relationships. Through close attention and reflection, the energetic essence of your life emerges and the truth appears.